Present Owner: 3031632 Manitoba Inc. The Fort Garry Hotel is unique in Manitoba, the last surviving grand hotel from an era when such buildings were at the pinnacle of architectural achievement. 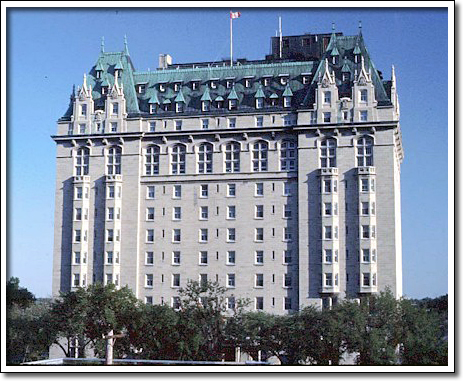 Designed by the notable Montreal firm of Ross and MacFarlane, the hotel is the province's sole example of the Chateau style, an architecture that came to be seen as a distinctly Canadian style, combining qualities of the French Gothic with a strong Canadian impulse for large, dramatic architectural gestures. In its grand and luxurious public spaces the Fort Garry Hotel retains high levels of integrity in the display of a variety of expensive features, materials and finishes. Located a block west of Union Station, the landmark hotel also maintains its important historic and visual links to the building that was the economic source for its existence.